Namaste, friends. 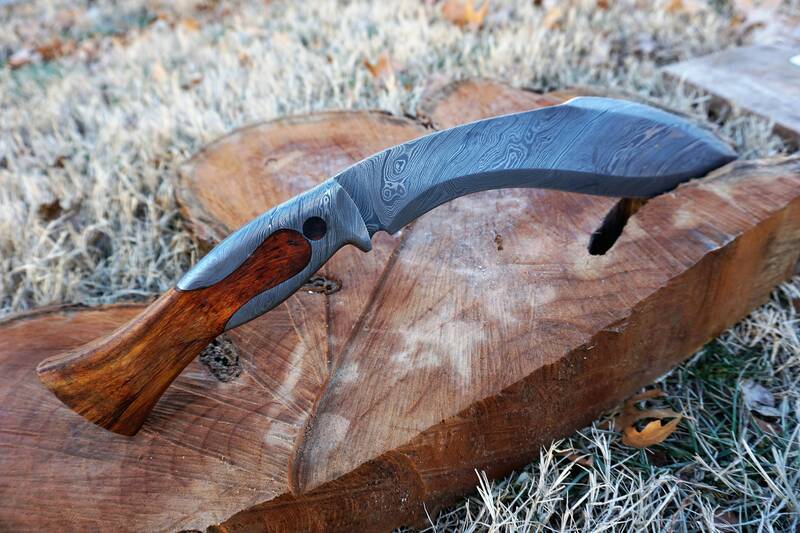 The Nepalese land of harsh beauty is perfectly embodied in this kukri form. 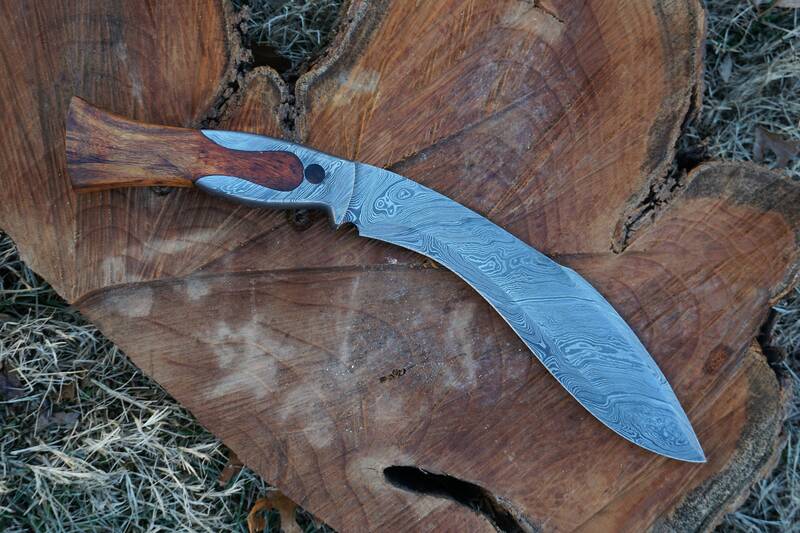 The mesmerizing 11 inch damascus blade seamlessly flows over the 7 inch rosewood handle as if it were liquid. This tool has been turned into a weapon by the fearsome Gurkha soldiers throughout history, and is a force to be reckoned with. Be at peace...but be ready for war (or chopping tree limbs). Whatever your weekend brings! Damascus is 7x7 with 5 folds (448 layers). Disclaimer: This is a knife. It's sharp. And heavy. And sharp. Make sure what you're cutting is a tree, not your shin. Because that would ruin your day. You assume all responsibility for safe use upon receipt. 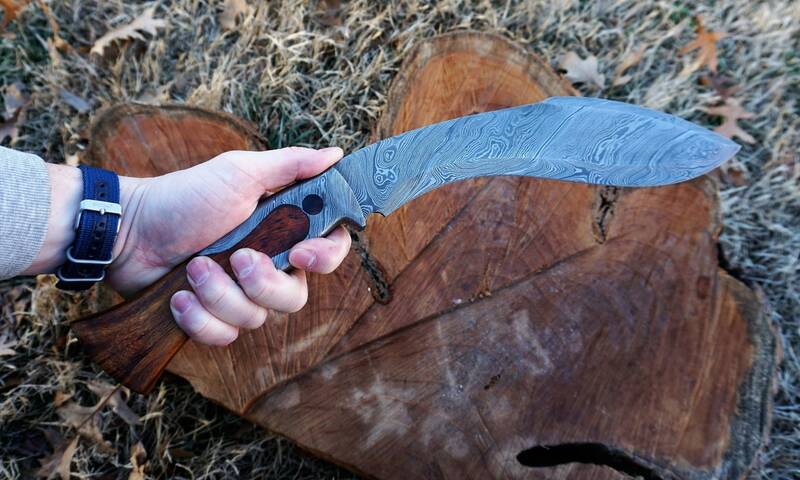 Damascus pattern and wood grain will vary. 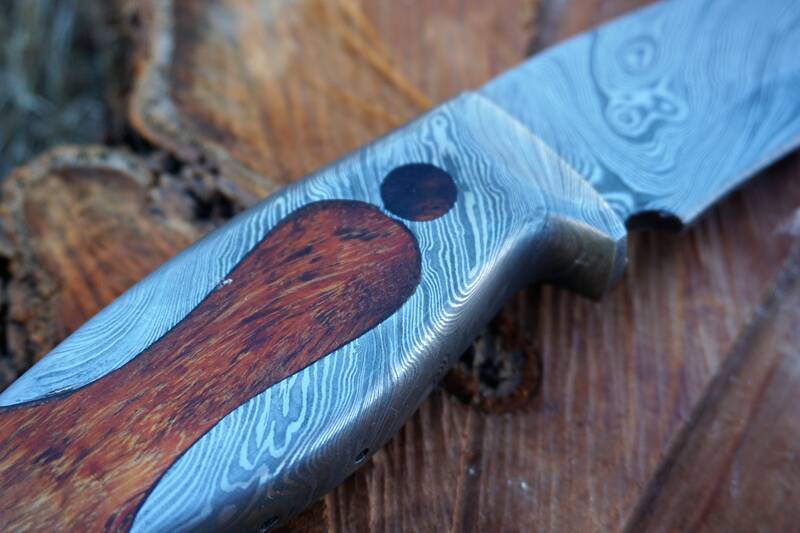 1095 high carbon and Damascus Steel are great at holding an edge, but will rust and stain if not taken care of properly. Please clean and dry your blade after use, and apply a light coat of oil (gun oil, coconut oil, canola...almost any clear oil) in order to protect the blade and add longevity. Of course! That's what this is shop is all about. 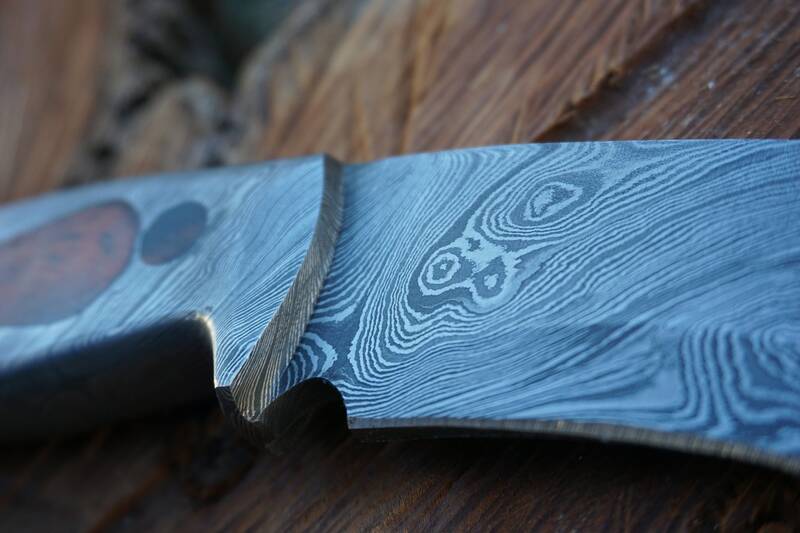 Polished blades are great for adding beautiful etching, and the wood handles can be engraved with anything from initials to a hand written signature, a corporate logo to your kid's drawing of, uh, an alien? person? Three legged hedgehog? Whatever it is, we can likely engrave it! Keep in mind the size a handle is, which limits the size and detail. Engrave one side: $15. No set up fee or by the letter fee. Etching: Varies by complexity, but usually about $25. Think big. Send me a message with your thoughts! I'll discount for big orders like weddings. I know money is tight! 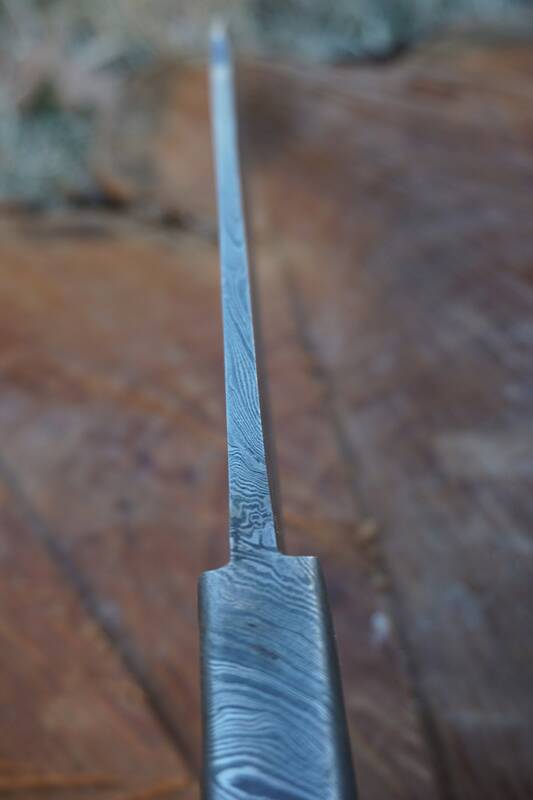 1095 high carbon and damascus steel will hold an edge very well, but they are not stainless steel. It may take on color with lots of use, and should be dried and oiled, if possible, to prevent rust. If you do get some rust, I prefer giving it a quick rub with a very fine (000) steel wool and it usually easily takes care of it without scratching the metal. I wouldn't go chipping away at rocks, but they're pretty tough and should last you a long time! These are usually orders of 15+. We can do almost any amount given enough time. You can engrave names or logos on the handles. 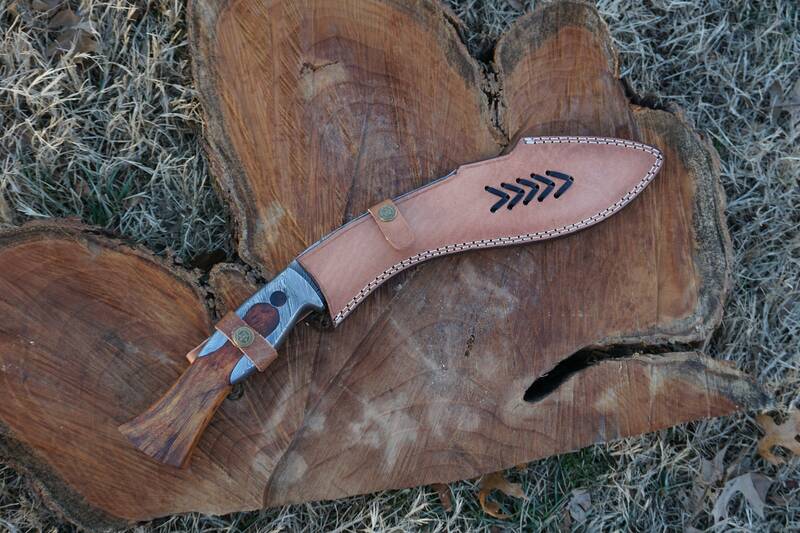 You can replace my AIM logo with your own etched into the blade, or we can make a custom metal stamp of your logo for the leather sheaths. Just remember, these are custom made and hand crafted, so we need months, not weeks. The more customized, the more time we need! They look ridiculously awesome, so bring it on! Look for the "coupon code" at checkout. Don't tell everyone. Bask in your secret reward for doing due diligence! Yes. Oh, you want more? Just send me a note to discuss! 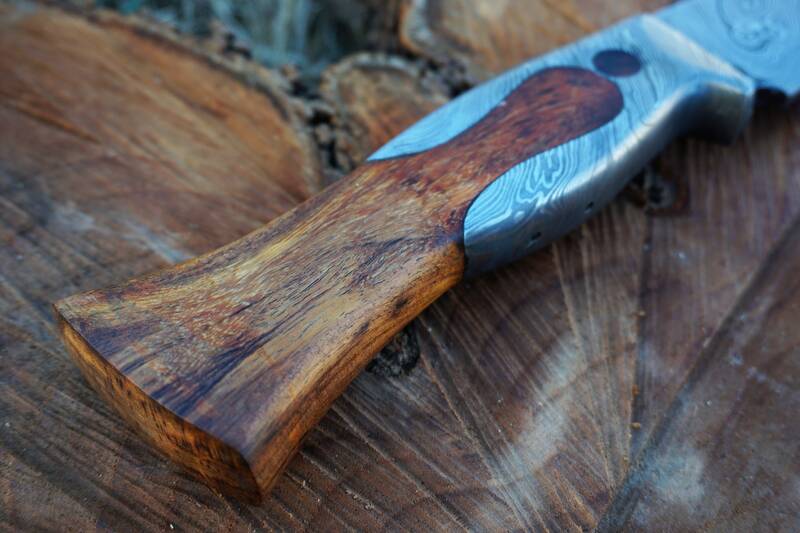 -Engraving goes on the wood handles, and possibly the leather sheaths. It's a laser engraver, so burning the image in. I can fill it with color on the handles, but not the sheaths. It can do fairly detailed images, EVEN HAND DRAWN PICTURES AND WRITING. Be creative! -Etching goes on the metal. 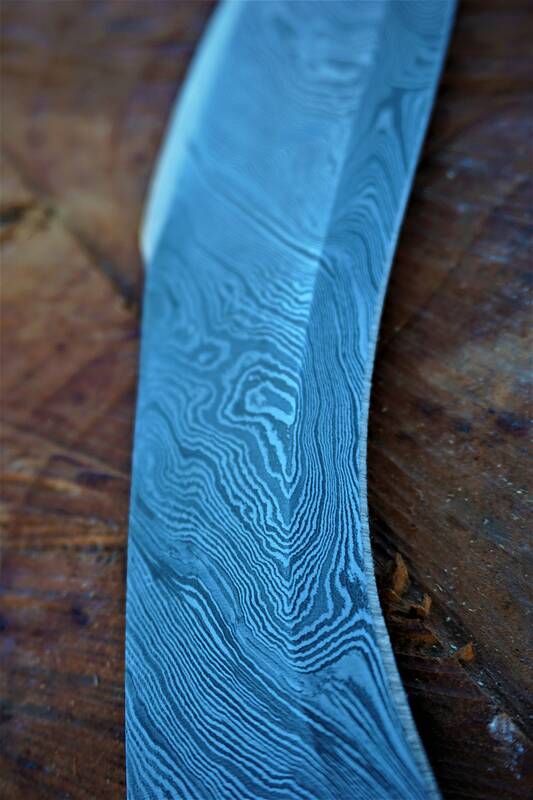 It looks great on the polished metal, but can be hard to see on the damascus. This need to be less detailed. Think words, numbers, basic designs. 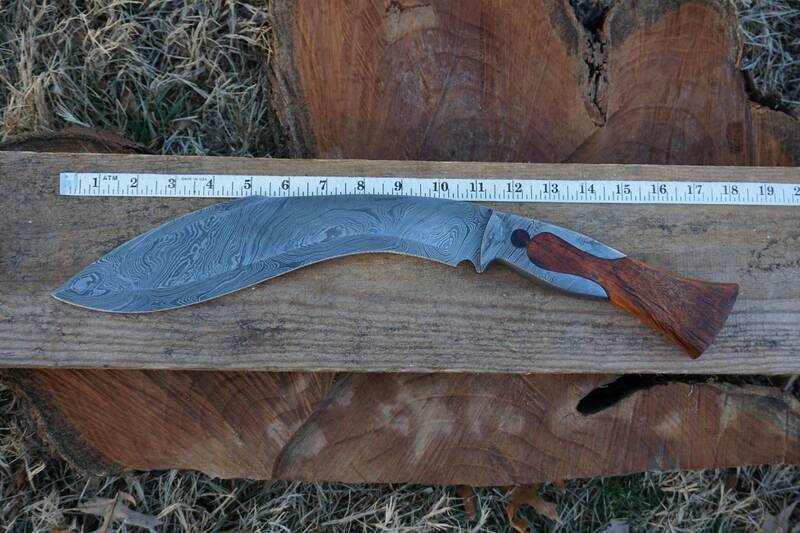 I will do full custom jobs for larger orders, including blade designs, handle materials, custom deep etched logos (instead of the AIM), custom leather stamps on the sheath, etc. Your corporate gifts can be awesome! I'm open to the discussion. Send me a note!